Three years ago I bought an HP Pavilion laptop (DV9000) with a 17inch display running Windows Vista. All has been well until last week when it died. My laptop symptoms were that I pushed the On button and the LED lights turned on for a few seconds, then the computer turned off for a few second, and then it started an endless cycle of trying to start-up again. A quick call to my local HP laptop repair place in Beaverton confirmed the technical issue and a reasonable $260 repair bill for a new motherboard and labor to install it. 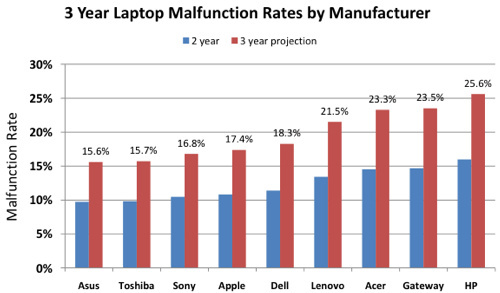 We all love our laptop computers however when the reliability rate becomes so poor because of thermal and other technical issues it causes me to wonder when the consumer electronic companies will design their devices with an improved reliability rate. On the EDA side of things I’m wondering if there is any software that would’ve predicted this thermal issue with the Nvidia GPU chip soldered to a motherboard. I’d love to hear from my readers if there are any EDA tools out there that take into account thermal reliability for something like a laptop system. 5 users commented in " An HP Laptop with Thermal Issues "
Great write-up, Daniel. I know a couple of folks that have this same problem. I’ve done my own LCD replacement on two laptops so that is another common item that goes bad. It just gets me when a large company like HP doesn’t offer a recall on what is a defective manufacturing process with Nvidia chips soldered to the motherboard. Buyer beware, time to consider buying the three year warranty for your next laptop. That’s the only practical course for a business laptop user. There are many simulation tools to predict the thermomechanical problem you are describing but no one can predict workmanship and the failure to catch it! I am pretty sure the engineers at HP used Ansys or CAEFEM or NASTRAN FEA software to model the package to board solder joints and studied the reliability under cyclic thermomechanical loading that comes from the usage of the laptop. These simulations are not capable of capturing defects in manufacturing / assembly. Thanks for the info on Ansys, CAEFEM and NASTRAN FEA. More to the story. After my laptop motherboard was replaced (to fix the nVidia chip suspect), the system worked for a day then suddenly lost power, just like before. Brought it back for repair, this time with motherboard #3 and a different CPU. Took it home, same result, worked for a day then suddenly lost power. Returned to the laptop store, picked up my computer with the original parts and went home to upgrade my 250GB hard drive for a new 500GB hard drive, hoping that this will fix the issue. FYI – it’s not easy to clone your old hard drive to a new hard drive with Windows 7 (requires 3 drives). Ultimately I had to buy a program from Acronis to do the job. In 2005 when I upgraded a desktop hard drive the new Hitachi drive had a free SW utility that worked great with Windows XP (not at all with Windows 7).